As part of Marshall Cavendish Benchmark’s Celebrate the States series, I’ve written books about OREGON (where I live), WASHINGTON, UTAH, IDAHO, ALASKA, and NEVADA. 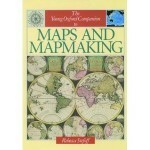 The longest nonfiction book I have written was THE YOUNG OXFORD COMPANION TO MAPS AND MAPMAKING, published in 1995 by Oxford University Press (the British Museum Press also published it). The manuscript for this book, when printed out, was more than 950 pages long. Other books related to geography are listed under “American History,” “Exploration and Discovery,” and “World History” on this website.